Say Hello to the New Dog Block Series Puppies! This just might be the last official Electric Quilt Brand Ambassador post of the year. Not only is the year coming to a close, but my computer is very much out of room (literally only 22gb remaining). Somehow I was able to delete enough "stuff" to get this post put together for you. I've had so much fun experimenting with the Electric Quilt Company Block Spotlight each month and decided this time to screen record it. 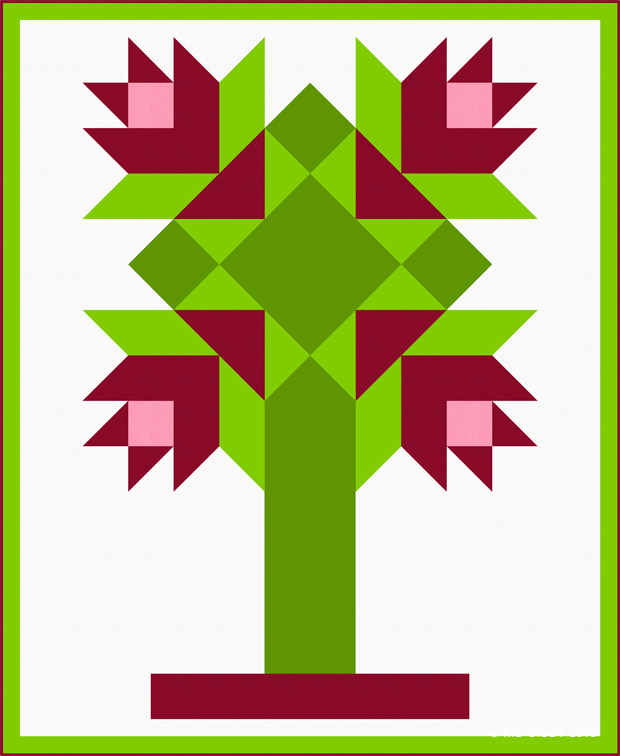 This month is the Amaryllis Block which is perfect for the Christmas season, but also works great for the spring time too, especially when Easter rolls around.If you haven't tried making a quilt and uploading it to the EQ8 Block Spotlight post, you really should give it a go! When I am working with a block and trying to figure out a quilt layout, I treat it the same as sketching in a notebook. I just start and keep going to see where I end up. Remember though, it's so important to save each quilt as you go along so you can go back and look at them all, and select your favorite to sew together when you are done. The first picture I posted above is actually the last quilt I designed. 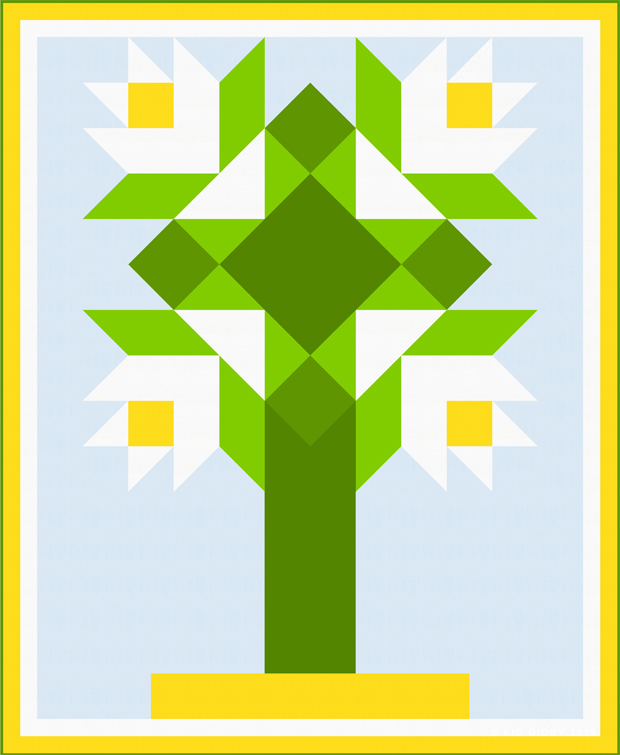 It feels super modern and geometric for a flower, but also directional and sharp which was very different than my first below. I was trying to stay away from symmetry, but my ambidextrous self has a hard time doing that. I added some rows and columns and made it symmetrical and also rectangular. Here you can see with rotating the blocks, the star really pops and become the focus of this design. 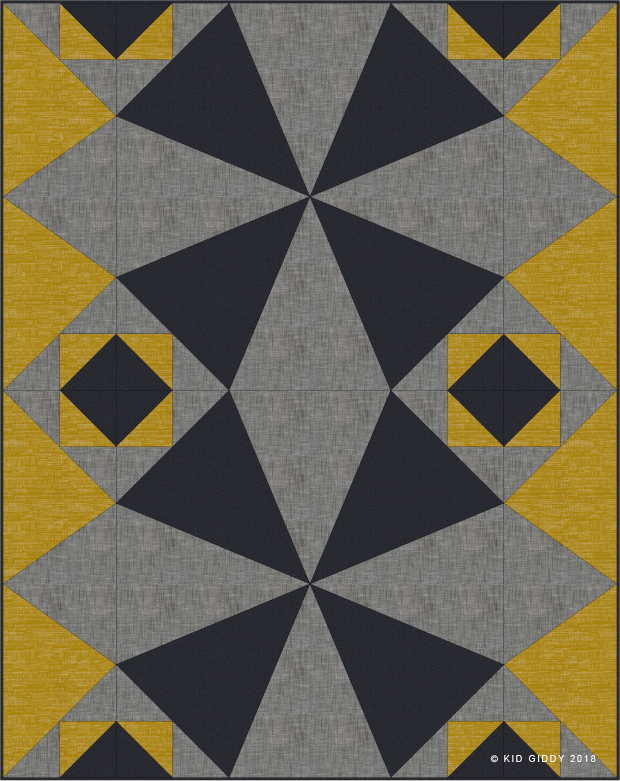 When you start playing with color and even the oh so fun "Randomize" button, you get a whole entirely different looking quilt, with a very different focus. Experimenting further but now as a more pictorial quilt, I tried using the Amaryllis block to look like the Amaryllis plant with it's long thick stems. Once I had this layout, I wanted to try the other colors most typically seen with the Amaryllis plant, of white and yellow. It would make a beautiful Easter wall hanging I think. Perfect for spring decorating in your home. You could easily add one more Amaryllis block in a smaller scale in that very center square that is created with all four corners. Now that you've seen all of the blocks, watching my video below (or on YouTube) will allow you to see the steps I took to get to each design. Be sure to subscribe to my Kid Giddy YT channel for new videos in the future. What do you think? Do you have a favorite layout? 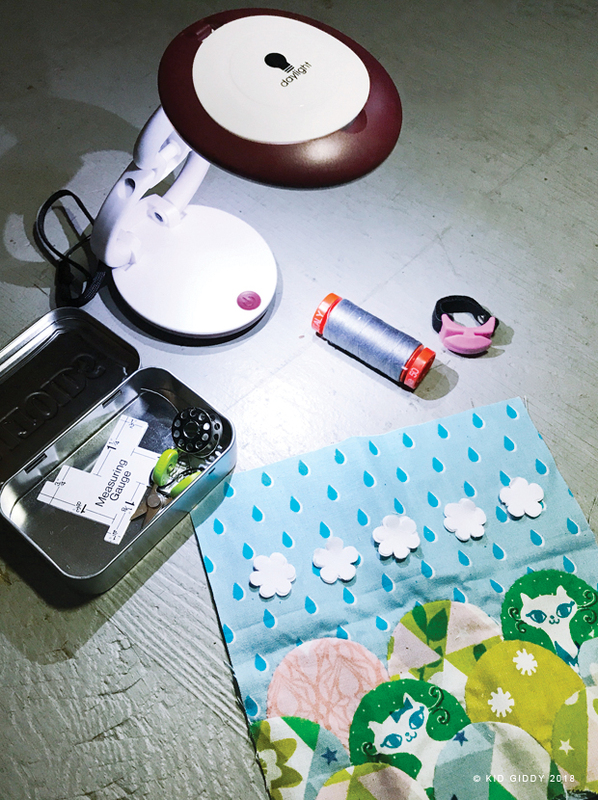 Have you tried experimenting with the Electric Quilt Block Spotlights each month? It's a great exercise and great practice to get to know the program, so if you haven't already, I highly recommend you challenge yourself to give it a go! I just want to add before signing off, that I am truly so grateful to be able to work with great companies like the Electric Quilt Company, especially while being one of their Brand Ambassadors this year. I have been using their product for many years now, and still find something new when I break out of my own box and pick a new tool I haven't used before. (Which reminds me - while visiting the EQ website, if you want to add anything to your stash, you can use the code "EQ8Kerry" to save 20% off your purchases before the code expires at the end of the year). With that said, I am also truly so grateful for each and every one of you that has supported me in my pattern making and design work. I appreciate when you give me credit for the patterns of mine you are using, because it allows me to see how you interpret them and how much fun you are having with them. It also further supports me by helping your friends know where they can get the pattern too. 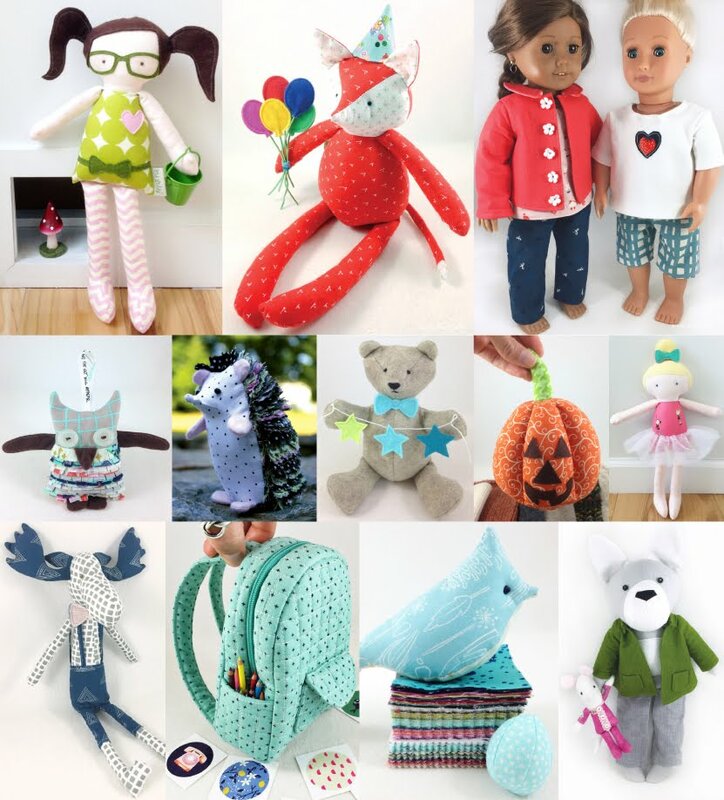 Thank you from the top and bottom of my heart for every time you've read a blog post, every like or comment on social media, every purchase and share of one of my patterns. You all inspire me every day with your excitement and enthusiasm. Wishing you all a Merry Christmas, a belated Happy Chanukah, or Joy in the holiday you celebrate. May you all have a wonderful, safe and prosperous Happy New Year! Disclosure: As a brand ambassador for Electric Quilt Company, I have received the EQ8 product for free, but the opinions and comments provided are always my own. This is not an affiliate code. Thank you. 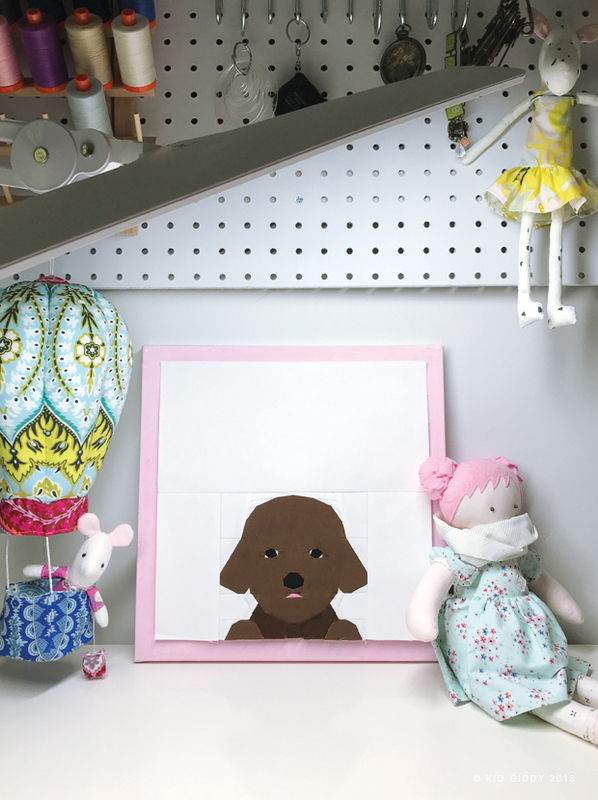 Many of you have seen my newest pattern the Sew Plush Planner on my Kid Giddy Instagram feed and some of you lucky folks got a glimpse of it at Glamp Stitchalot! But now I'm sharing it over here with some more details on how this started as the Bullet Planner Page Blocks I designed in Electric Quilt EQ8 program and became so much more! The Sew Plush Planner started out as a two Foundation Paper Piecing blocks I designed in Electric Quilt EQ8 program, that represented planner pages and tabs (or pages with tab dividers) for bullet journals and planners. What started as two blocks or "pages" for a placemat or "keyboard rug", became 4, and then 6 and then a whole quilt worth of pages and tabs and inside covers (because the EQ8 program makes it easy to make all the various blocks so quick)! I went down a really fun rabbit hole of "well if this tab is flipped over here, then this side would be less tabs than it started with". Then "if all the tabs were on this side, the front inside cover would look like this, while the back inside cover would look like this if they flipped to the other side". I couldn't stop until finally I was done and ran out of the basic options. Of course there are so many more options and hacks, but I wanted to stick with this here and see what more you all come up with to add to my pattern. As I began sewing the first two blocks, I immediately thought I want to have little tabs to actually pick up to turn the pages. 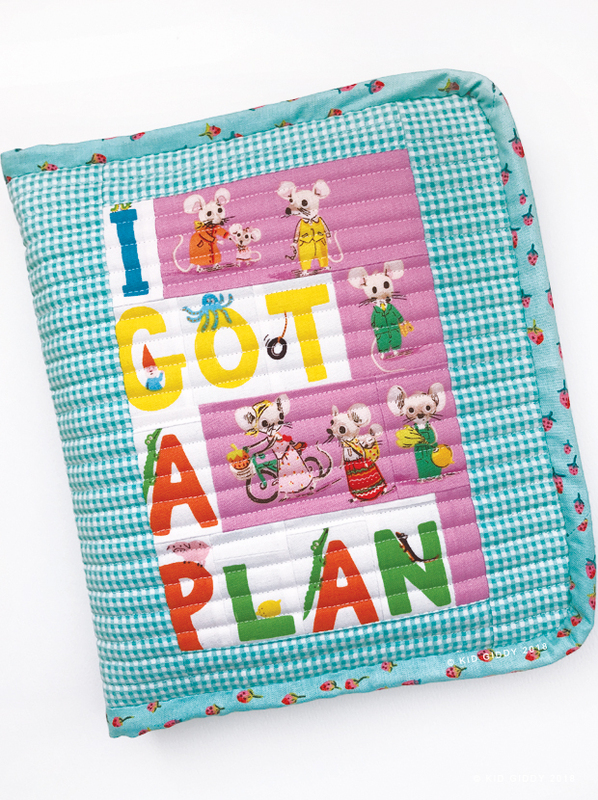 This one little thought started me down a whole new rabbit hole, now lovingly called the #SewPlushPlanner! Here's a quick little video of it you can see in action. There are so many options and different opportunities to mix and match and only make the "pages" you really need and want. Since designing it and putting it out and during (the many) conversations with my twin sister Sue @MossandLotus, we've decided it would make a great Plush Baby Book, a Plush Quiet Book (as we have always wanted to design and make since our kids were babies), Plush Memory Book and so much more! Make it plush, stick stuff inside and take it with you, or store it in a hope chest (if filled with memories). Use fun fabrics to really convey the message you want to send...I loved using the Trixie fabrics (and Kinder letters) from Heather Ross and the Jot fabrics from Heather Givans (both for Windham Fabrics). 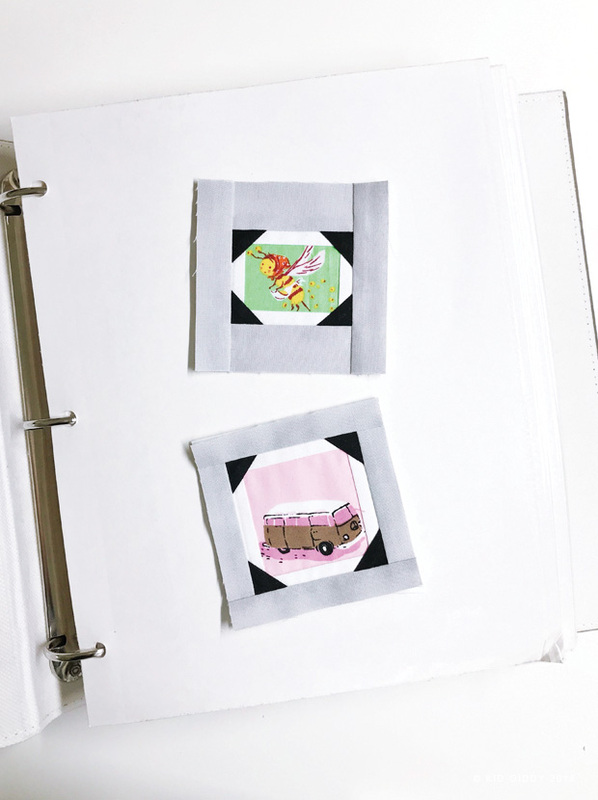 The little add ons for each page (or spread) are so fun and can be used for Sewing, Cross Stitching, Needle work, Scrapbooking, Planner Accessories and so many other things. 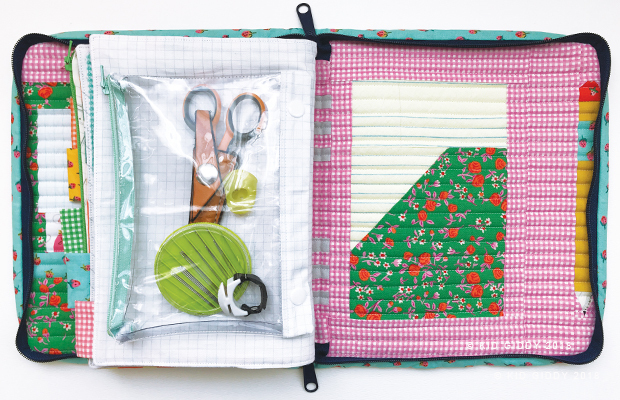 What will you use your SewPlushPlanner for? What will you stash inside? Do you have a favorite page? Let me know in the comments below or join my Kid Giddy Facebook group and share away! Thanks so much for stopping by and thanks so much for all the love on this new pattern of mine. So many of you have purchased it already and I'm looking forward to seeing all your #SewPlushPlanners! If you have a great add on hack idea - please be sure to share it with me so I can see and enjoy it! 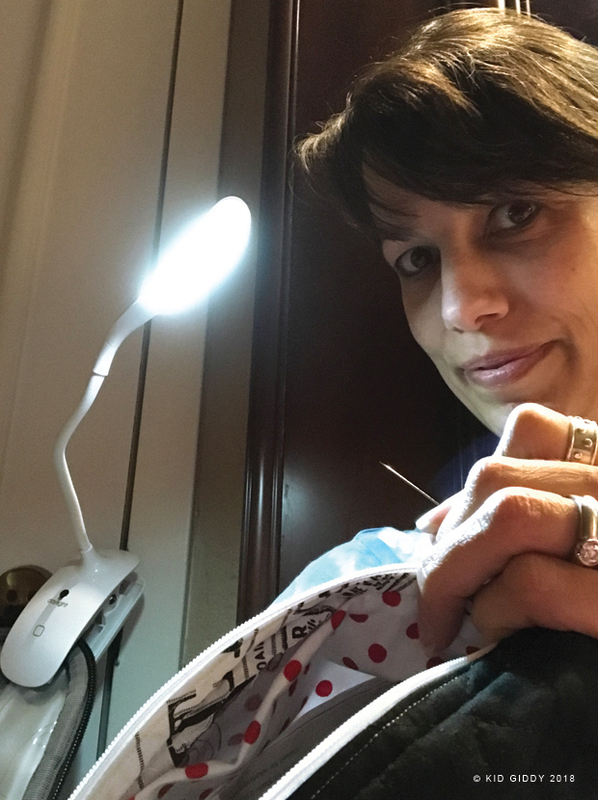 As I am one of the Electric Quilt Company Brand Ambassadors this year, they have given me a special treat for you...if you are interested in getting EQ8 for yourself or anything else on their site - please feel free to use this discount code "EQ8Kerry" to save 20% off your purchase (not an affiliate code). Have you tried playing around with the Electric Quilt Company EQ8 Block Spotlights? I've been playing with them and it's super fun. 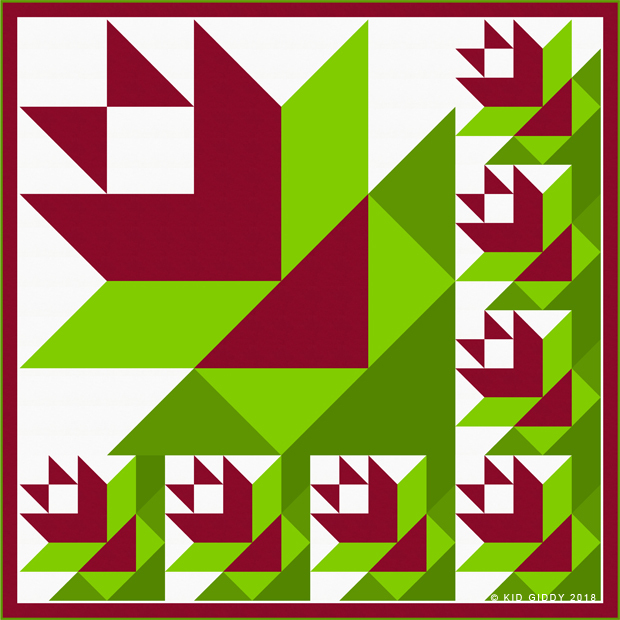 It's a great exercise and can help to open yourself up to come up with a different quilt with each block. I can't say different coloring, because I've been finding myself stuck on some specific colors, but different colorings would be great too. This first one, the July "Arrowheads" block just might be my favorite. I wanted to keep it large scale (as I've done with the others) but wanted it to also keep it simplified. I used a simple fall palette (despite it being the July block) as I thought about cuddling on my sofa in our Cozy Away room with the wood stove burning. 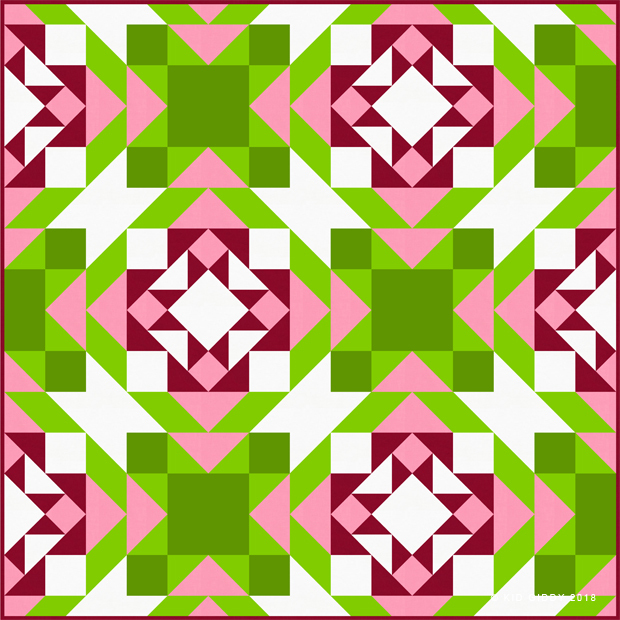 The quilt design was created as a Custom Layout with two full blocks down the center, and four partial blocks along the sides. 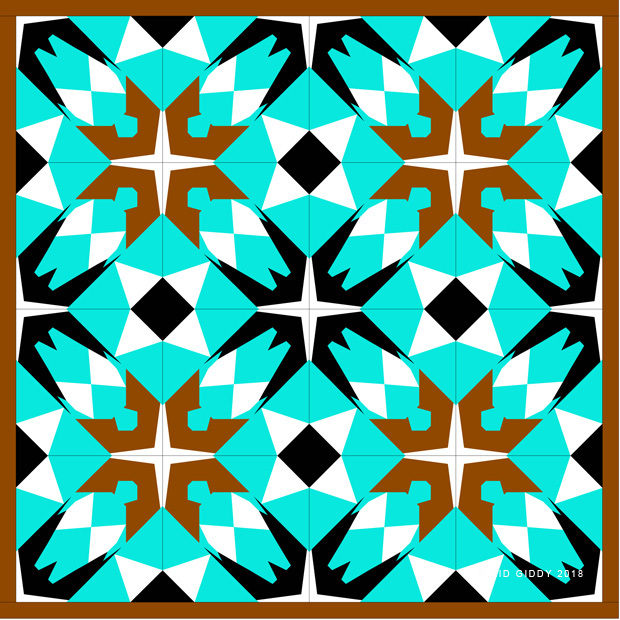 This next quilt is the August "Pyramid Kite" block. 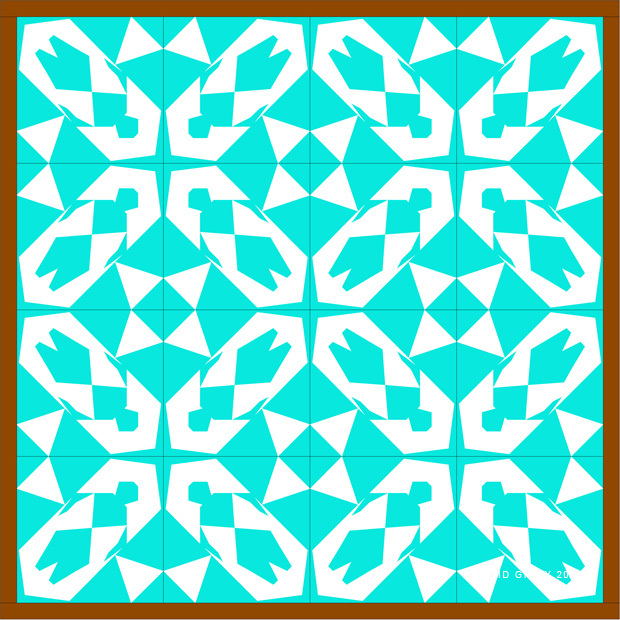 I added in the blue and white colors to lighten it up a bit but also kept this quilt design symmetrical. 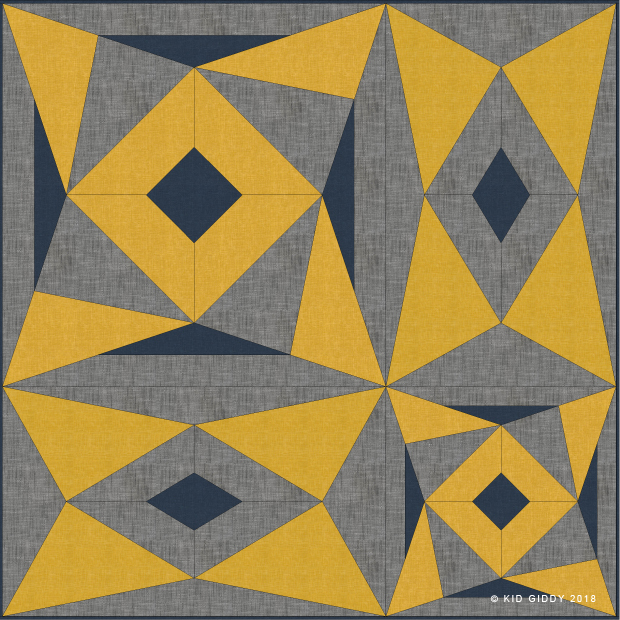 This quilt was designed using the On-Point layout in order to create a much larger On-Point layout block to focus on the X in the center. This last one (for now) is the September "Metalwork" block. I had a hard time with this block, only because it isn't symmetrical - lol. Never the less, I always love a good challenge. I reverted back to the warmer fall color palette, and used two full blocks and two simplified stretched blocks in the Custom Quilt layout. If you haven't had a chance to try out their block spotlights, I highly recommend it. 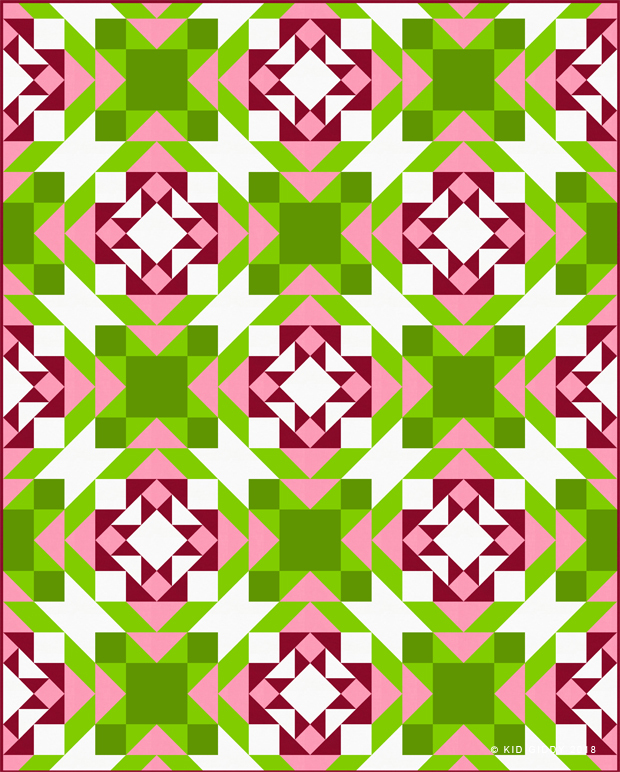 After you come up with a fun quilt design, you can link it up on their blog with each block post. You can see other designs others have posted as well. 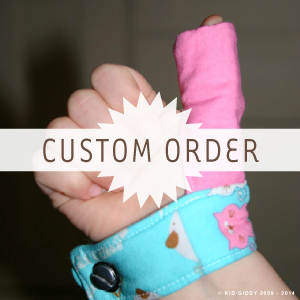 Remember while visiting the EQ website, if you want to add anything to your stash, you can use the code "EQ8Kerry" to save 20% off your purchases. Remember that car game where you're going on a picnic and you have to bring something that starts with every letter in the alphabet. I kept think about that game as I was traveling this spring and summer as I was packing. I'm going on a trip and I'm bring my Aurifil thread, Bags, (thread)Cutterz, Daylight Company lighting, EPP papers and so on. My first trip this spring was to Disneyland (I only went once when I was 16 and only for a day so this felt like my first trip ever - which was so exciting). On the flight down I got some hand sewing done on the airplane using the compact Daylight Yo-Yo Lamp. It was later in the afternoon but everyone wanted to nap and I felt bad having my overhead light on. So the Yo-Yo Lamp gave me enough light to work on my #QuiltsForMyDaughters hexies. After we arrived and upacked at the hotel, I needed to finish sewing the little cross body bags to use at the parks, that I made the day before. It was super late and everyone else was going to sleep so I set up the Smart Clip-On lamp. The bed frames at Disney are surprisingly enormous so I grabbed the next best thing...my luggage. The side table was on my husband's side of the bed, so all I had was the luggage rack and my luggage. I was pretty proud of my set up! lol. 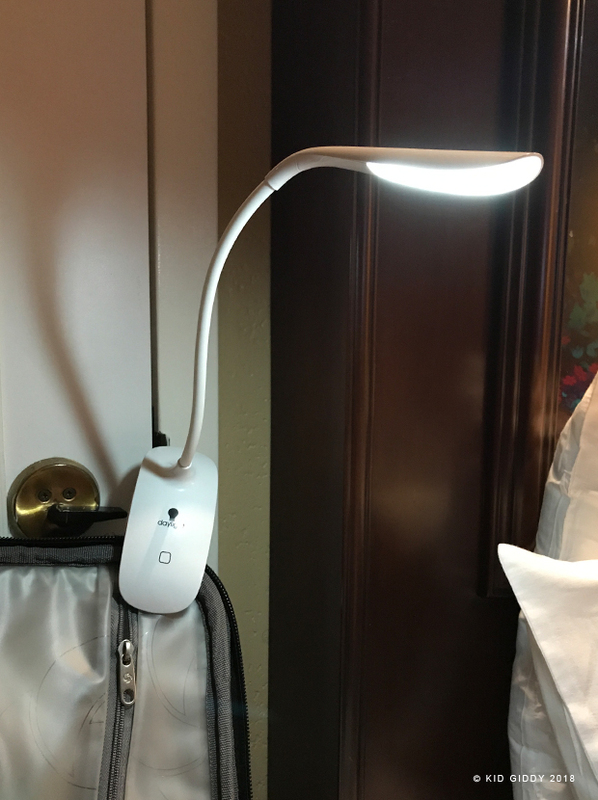 The Smart Clip-On lamp is cordless and rechargable, so I didn't have to worry about finding an outlet to plug it into. 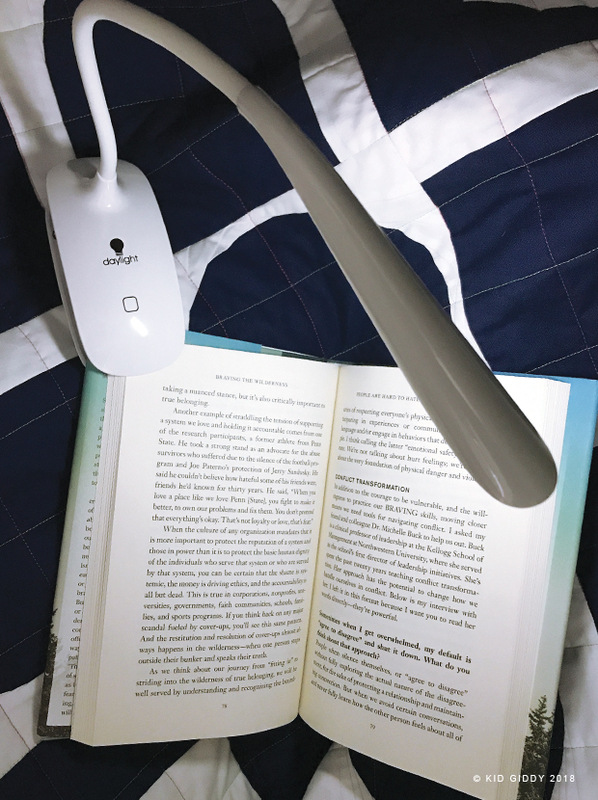 It works great for reading books too. Which I've been trying to sneak in at night lately and was doing as much of as I could this summer with our less hectic evenings. I clip it onto the corner of my book, which also helps to keep the pages open for me. During the summer I also traveled to New Hampshire for Girls Camp through church. A couple of nights while in my bunk, I had a little time to set up some hand stitching and the Yo-Yo was all the light I needed to get it done. Both of these lamps are so great to travel with. 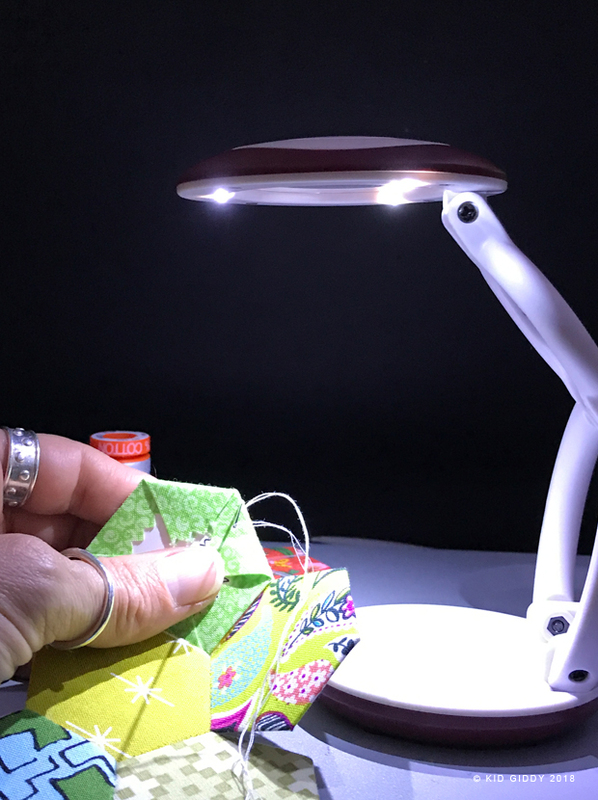 The Yo-Yo folds up and is the most compact and the Smart Clip-On lamp wraps around itself nicely (with the recharging cord clipped into the clamp). 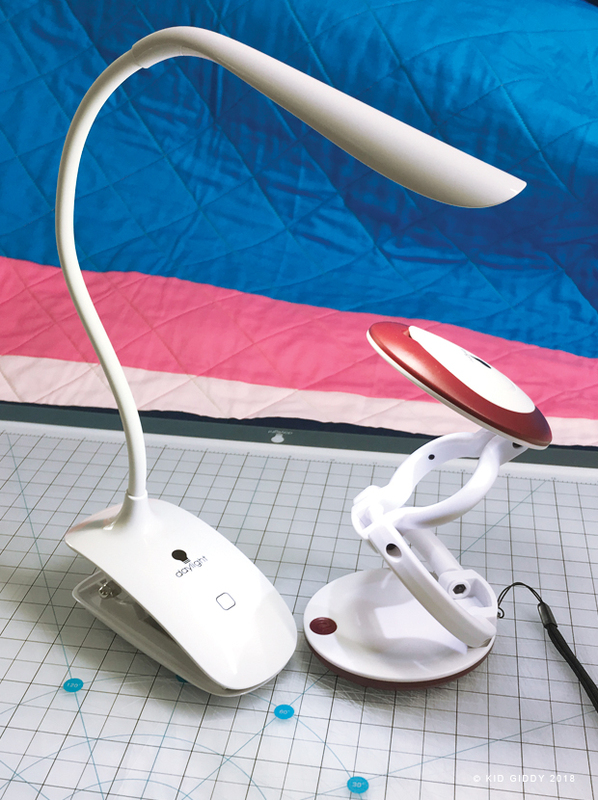 Both of these lights fit in my little sewing pouch with all of my other needs for sewing on the go. Do you need more lighting in your travels? Be sure to use the "kidgiddy2018" code on the Daylight Company website so you can save 20%. Please be sure to tag me on social media and show me which lamp caught your eye and you couldn't be without! Thanks as always for stopping by! Disclosure: As a brand ambassador for Daylight Company, I have received these products for free, but the opinions and comments provided are always my own. I will receive a small portion of the sale if you use the coupon code provided above on the Daylight website. Thank you. 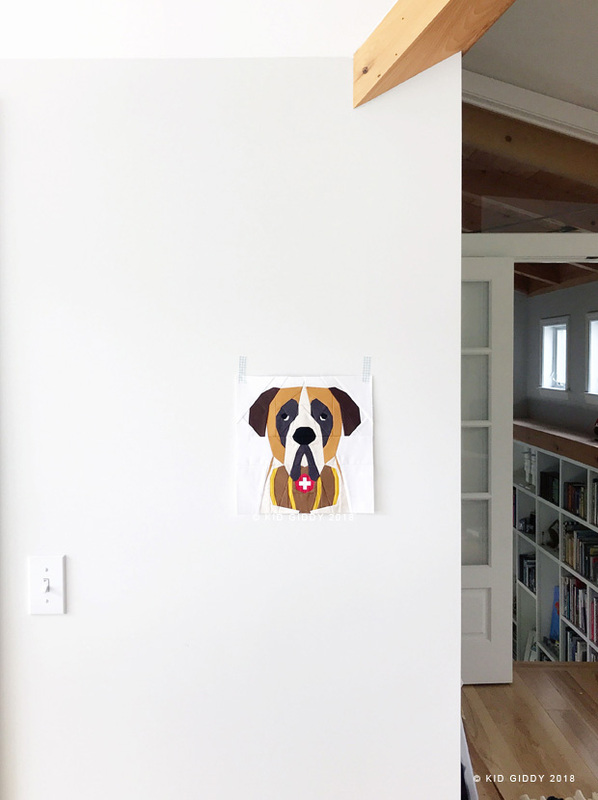 Back in August I released three new #DogBlockSeries puppies. The Saint Bernard, the Standard Poodle and the cutest little Mini Poodle (or Teacup Poodle)! All of these patterns we're created in EQ8 and are companions to the other 10" x 10" Dog Block Series pups and fit nicely into the Doggy into the Window Quilt. First up, the Saint Bernard. 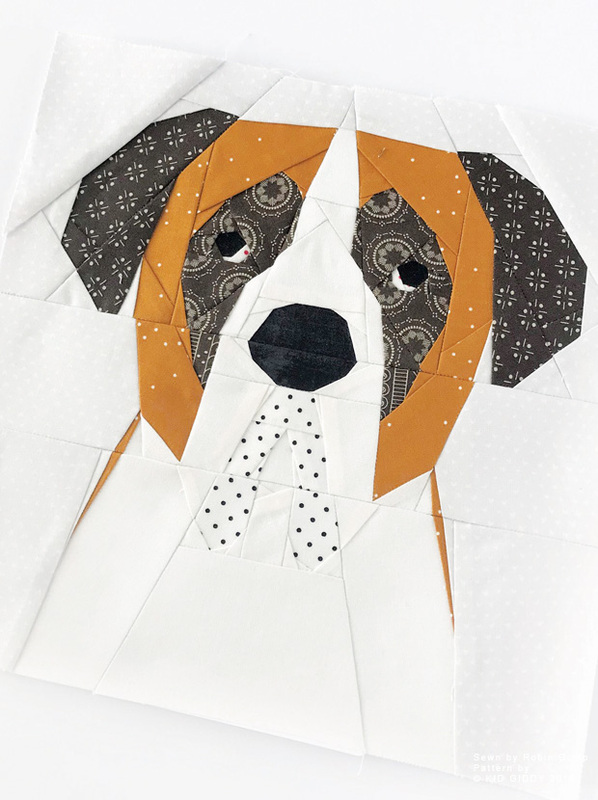 I started designing this Saint Bernard puppy in the new Electric Quilt Company EQ8 program, back in November but then sadly put it on the back burner when I got strep just after Thanksgiving. But he’s finally done and I’m so excited. One of my favorite stuffed animals as a child was my Saint Bernard with a barrel piggy bank attached to his collar. 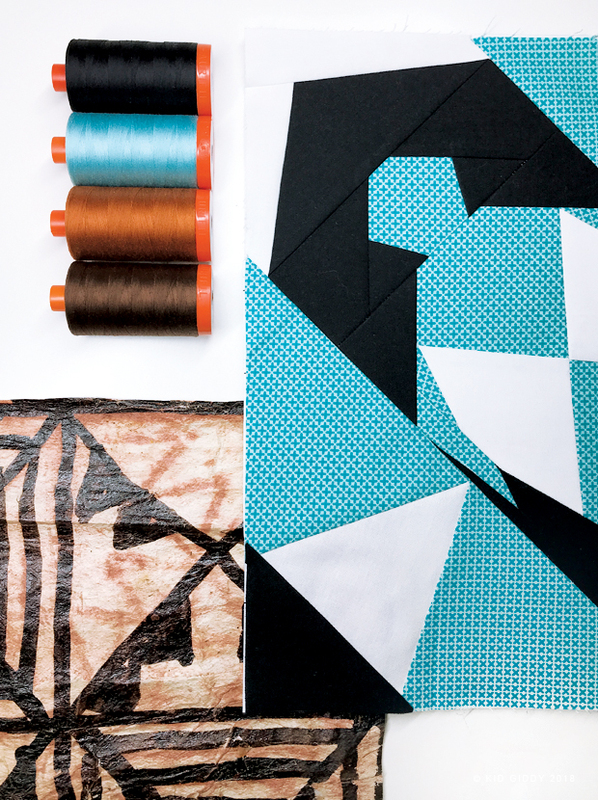 I wish I still had him, but now I’ve got this paper piecing pattern to remember him by. You can make the Saint Bernard with or without the barrel. The St. Bernard below was sewn by one of my testers Robin Gump (@SeamedToBe), and I love her fabric choices! 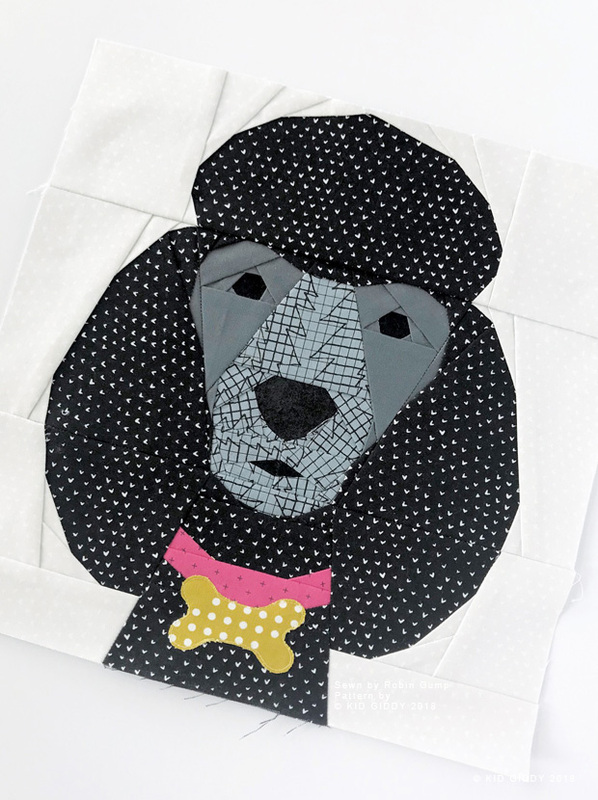 The Standard Poodle Block is up next...it comes with a collar and dog tag, but also comes with an extra (simplified) foundation paper piecing neck piece, and applique pieces for a collar and extra dog tags. This makes the block a little easier to make, but leaves room for a lot of opportunity to add your own touch of personality. The white Standard Poodle (sewn by Tori - @cloudtori) was made with all of the dog collar and dog tag block pieces. 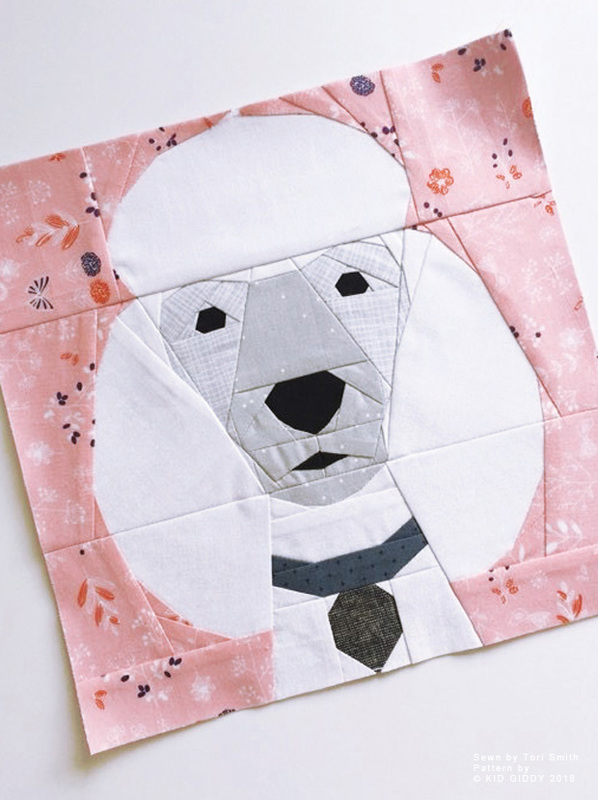 Robin Gump (@seamedtobe) chose to sew her Standard Poodle dog block with the paper pieced dog collar (and not the dog tag), but added the dog bone dog tag using a raw edge applique technique. Don't they look so cute?! Last but not least, is the littlest dog block in the whole series (so far), is the Mini Poodle. The Mini Poodle can sit along the bottom edge (just like all of the other pups in the #dogblockseries), and for a fun bonus, the Mini Poodle can also sit in a little teacup! These two samples, were sewn by my other testers, Kristi (@SchnitzelandBoo) and Laura (@LauraAust). You can see Kristi made hers so it looks like the bowl has a top rim, and the paws come over the edge. 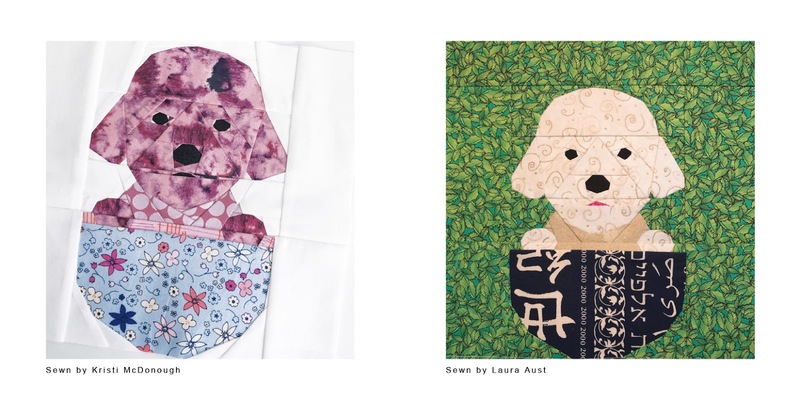 While Laura sewed her puppy with the paws on the top edge of the teacup (without a rim). There's always a new way to make it just right for you. I love seeing all the experiments! What do you think? I hope you can find a puppy to love in my #dogblockseries! I will continue to make new dog blocks. Don't see your favorite here? Let me know what your favorite dog is so I can add it to my list. You never know, your dog could be next. 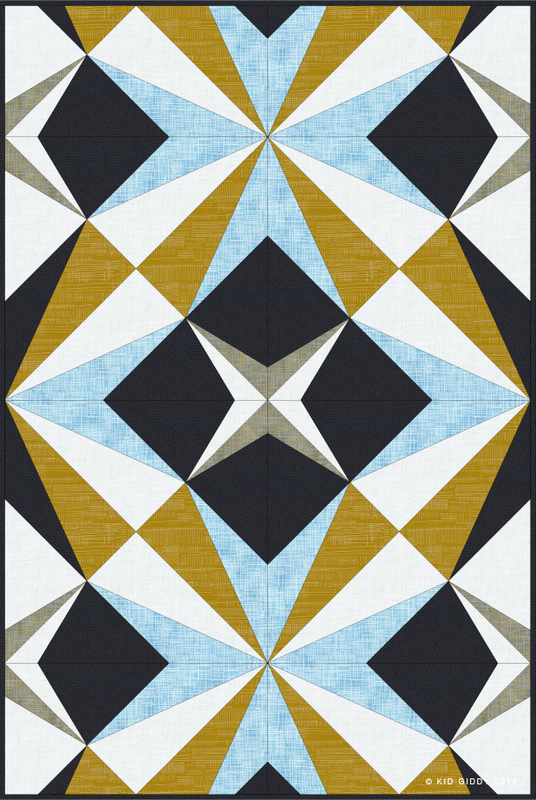 Just a reminder that Electric Quilt has come out with two new EQ8 Designing Quilts books where you can learn all the tricks and tips from EQ8 designers. My tutorial is included in the new book below. See that Sailboat Ship block on the back cover of the book? I'll teach you how to design the Sailboat Ship block and quilt using my very own photo, step by step! You can grab your copy at Electric Quilt (and make sure you use the code "EQ8Kerry" to save 20%. 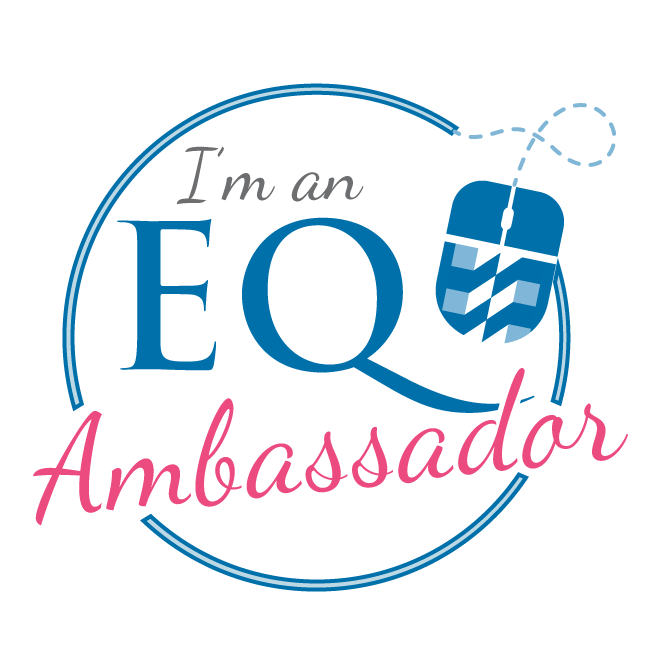 Disclosure: As a brand ambassador for the Electric Quilt Company, I received EQ8 program for free, but the opinions and comments provided are always my own. I can't believe it's halfway through June already! That means I am the Aurifil Designer of the Month and my new Tonga Block has been posted! Last year (Quilter) Pat Sloan invited me to be a part of this years Designer line up and I couldn't have been more excited! 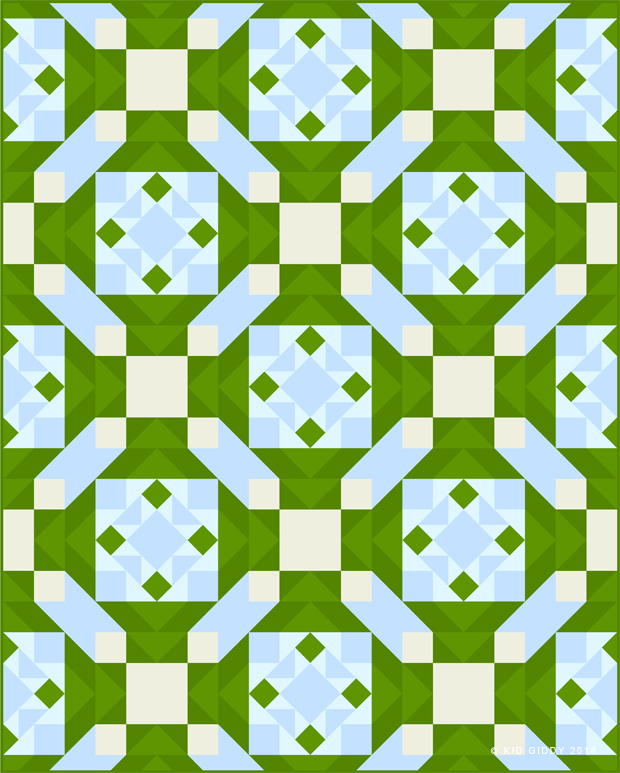 Naturally I picked June (because it's the best month = summer) and created for all of you the free Tonga Block in EQ8. I had a lot fun making various color combos and playing with potential layouts in EQ8 and you can too. EQ8 makes it so quick and fun! I think my fav is the 4 color combo. Do you have a fav? I ended up using the same layout, but wanted to show that with various color combos, it can look very different. Do you want to know what inspired my Tonga block? You can read more about it on the Aurifil blog. 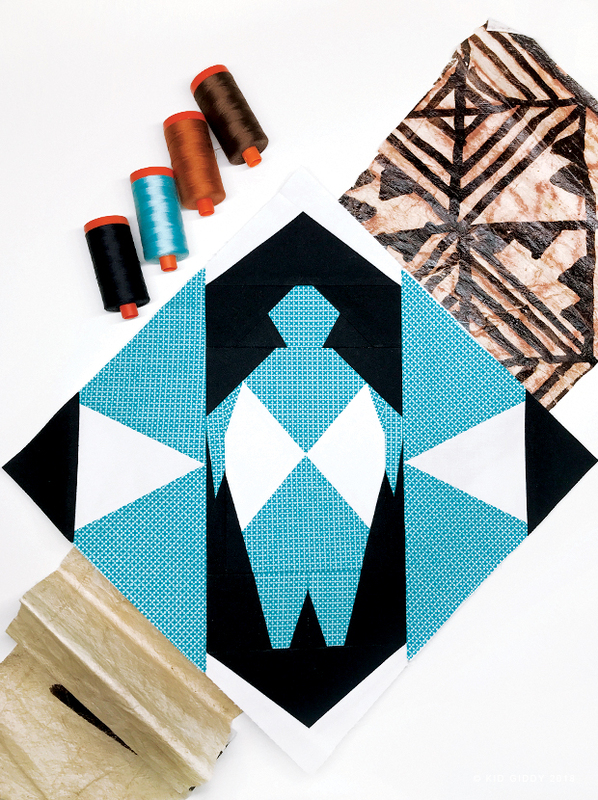 And when you are done printing out your free Tonga Block, head on over to Pat Sloan's blog to see some Tonga Block Sewing Tips she shared. When you finish sewing your Tonga Blocks, please share them with me on social media by tagging me @KidGiddy, #kidgiddy and AurifilDOM2018! I've been rather quiet here on my website, because I've been so busy in the studio with tons of secret sewing and designing, that I haven't shared with you some fun new patterns I've created in EQ8 yet! I could sit and design patterns in EQ8 all day because it's so easy. Getting those designs sewn up and formatted into a PDF for you is the harder and more time consuming part, but worth it in the end...right?! 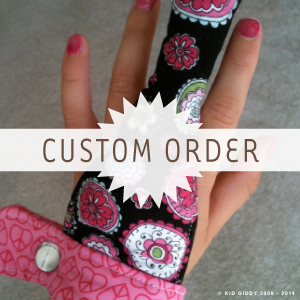 Well here are some new patterns I have listed in my shop. First up is a collaboration I did earlier in the year with AnnKelle (Kelle Boyd). 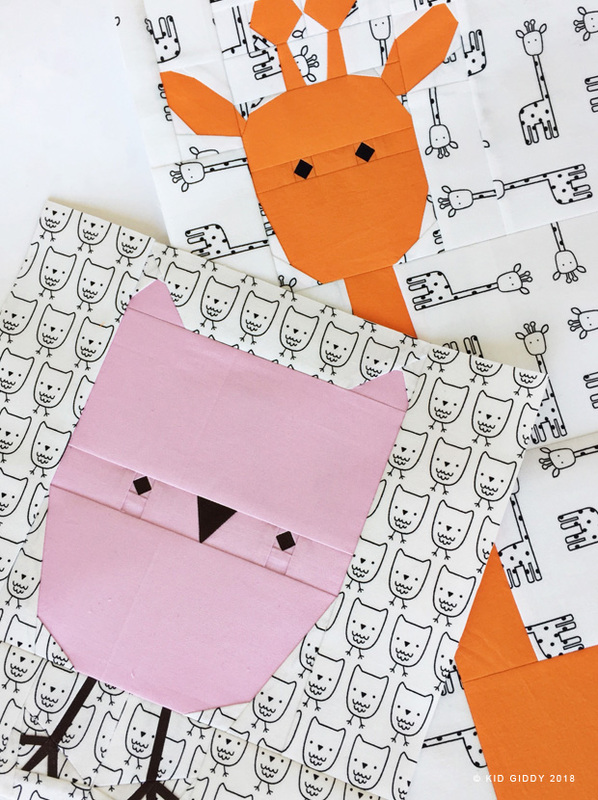 She had these cute giraffes and owls prints and I just had to make them into paper piecing blocks. I wanted to keep them relatively simple - so I stuck with her designs instead of going crazy detailed. I'm only offering them in my Etsy shop (to control the VAT tax purchases), but after all the etsy and paypal fees are taken out, the rest of the money from each set sold, will go to a Backpack program that puts food into children's backpacks on weekends, during school vacations and summer. I'm so excited to help this cause and ask that you help contribute where you can as well. Food insecurity leads to learning difficulties as well as many other issues. Kids should never go hungry. My next quilt is more of a personal design. 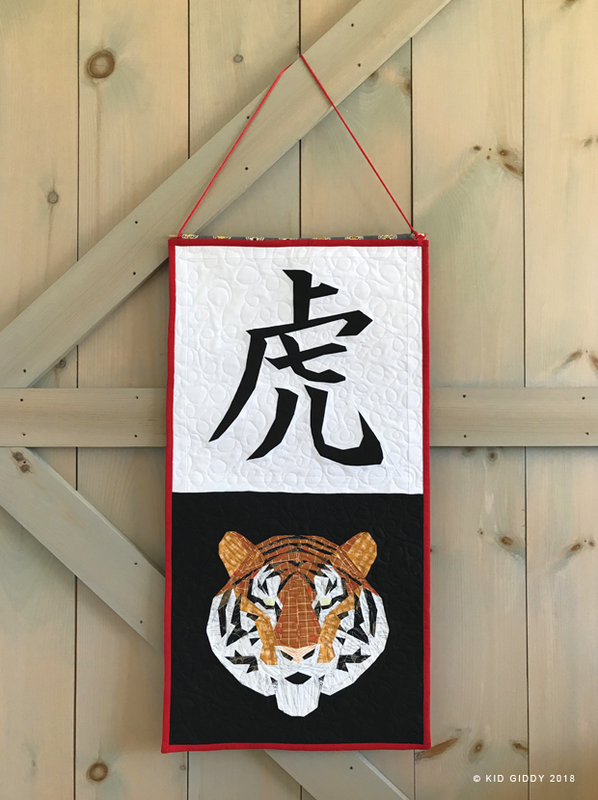 I'm going to be making various Martial Arts animals for a quilt of my own, and started with the Tiger Tiger Quilt, as a gift for my former Sensei that moved down to Texas. He felt the Tiger was his Martial Arts animal, but I was also born in the year of the Tiger. I included the character for Tiger up above the face of the tiger. Each animal I design, will also have it's Mandarian/Kanji character above it so I can learn a little of the languages as I go. I also find Chinese and Japanese calligraphy to be beautiful and couldn't leave it out of the design. 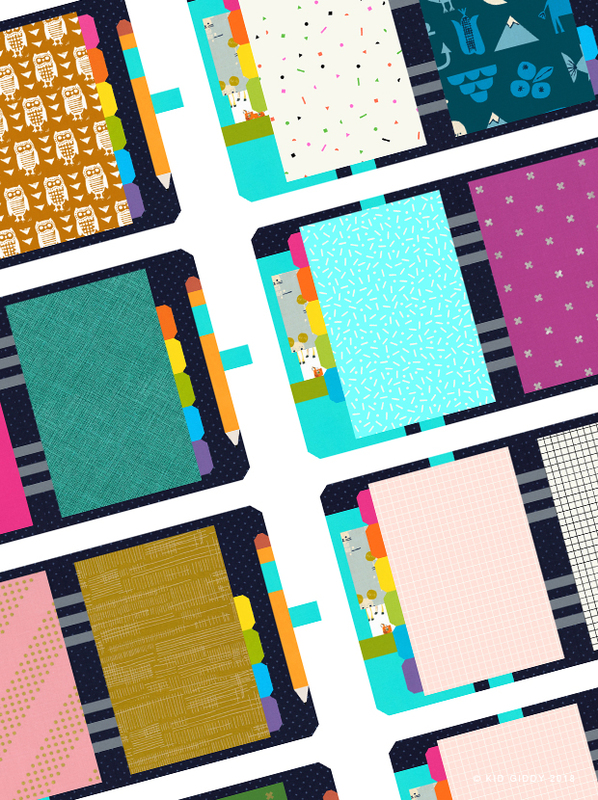 I finally sat myself down and mapped out the Vintage Photo Album Quilt blocks. I've had this idea for well over a year, and kept pushing it further to the back, silly me. 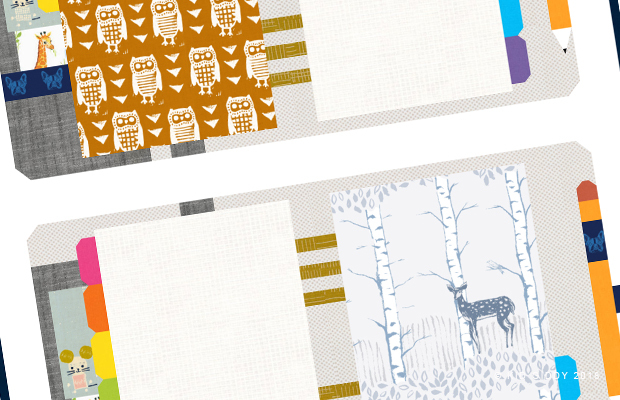 It's one of those really quick and easy mix and match patterns that you can fussy cut to your hearts content. There are so many options and the results are super cute! I'd love to print some of my family photos onto fabric and make a genealogy quilt that shows my family tree. It would make a great memory quilt too. 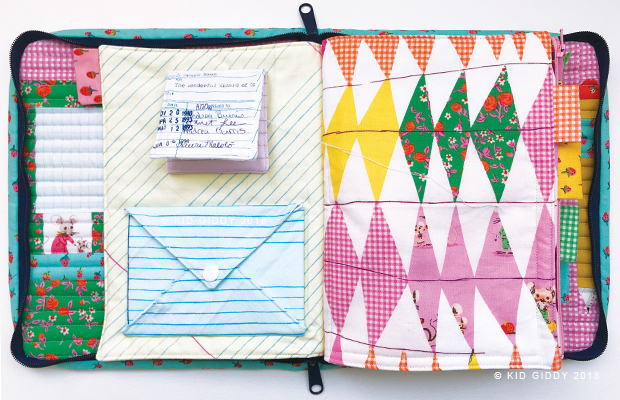 There are so many blocks and options (just two shown below), but please know - no quilt instructions or measurements are provided because of the mix and match - make your own concept. 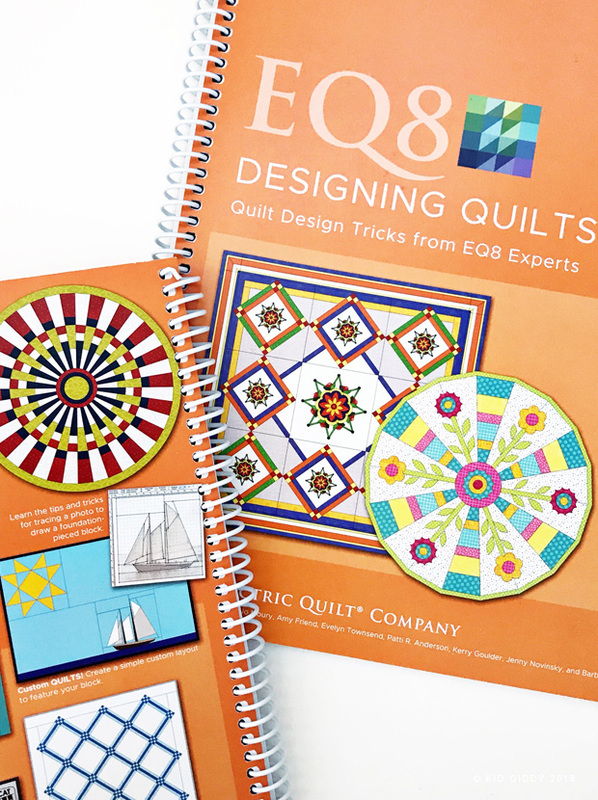 I'm excited to share that Electric Quilt has come out with a new EQ8 Designing Quilts book where you can learn all the tricks and tips from EQ8 designers. Myself included. See that Sailboat Ship block on the back cover of the book? 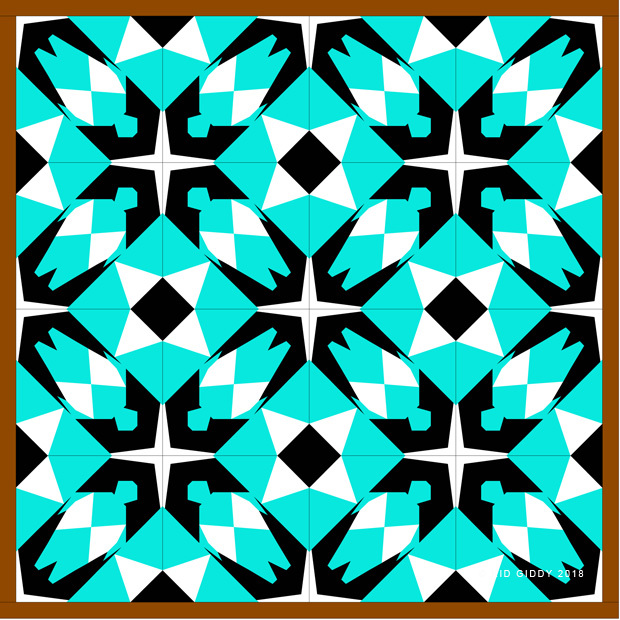 I teach you how to design the block and quilt using my very own photo, step by step! 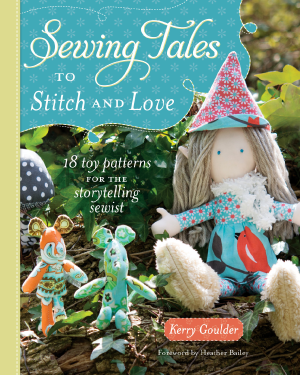 You can grab your copy at Electric Quilt (and make sure you use the code "EQ8Kerry" to save 20%). There's a few more new blocks coming, but those are still a secret. Hopefully these can keep us all busy sewing for a bit until I can release the others. Do you have a favorite? Is there a design you are pulling for? Maybe it's a new block I've got in the works, or can add to the future list? !